Unlike imitators, LUMINEERS® are made of patented Cerinate Porcelain, and the only dental veneer system backed by over 20 years of clinical success that allows you the option of having a NO-Prep placement. LUMINEERS® do not require subgingival placement, and when used with Ultra Bond™ resin cement and Tenure™ adhesives, prevents cracking and crazing during finishing. LUMINEERS®, after placement, mimic the DEJ, giving our patients seamless margins without a shoulder. 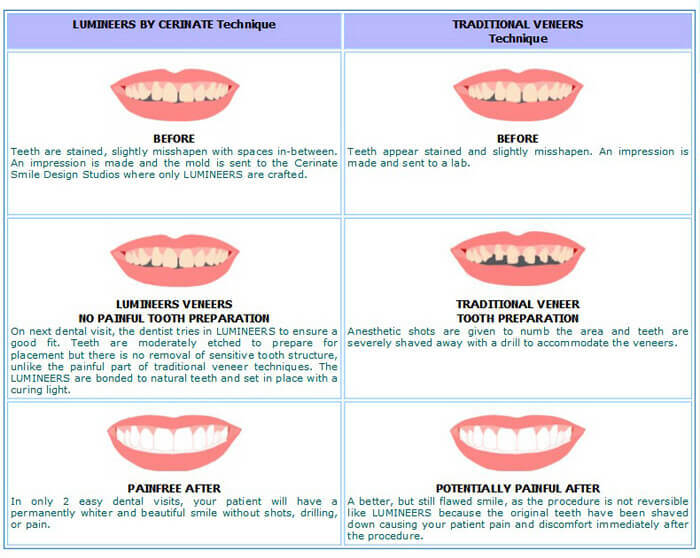 The procedure is simple and cost-effective, compared to traditional veneers. See for yourself! Send in an impression on your next case and we will send you a diagnostic model to compare the difference to what you are currently using.